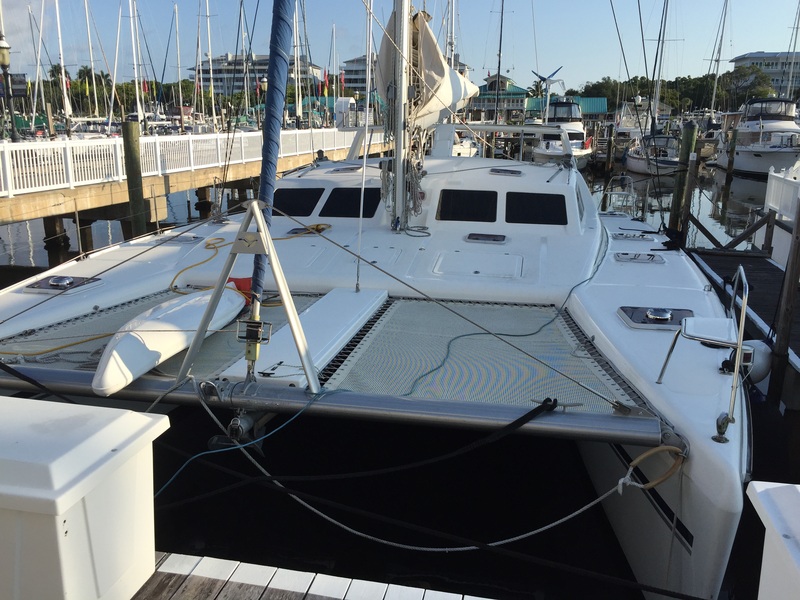 As I mentioned in a previous post, our catamaran, SV Aphrodite, is having some refits being done in Florida. The new trampolines have been installed. And, I have some pictures to share. Here is what the original trampolines looked like. And, as you will see in the next photo, we changed the trampoline colour and density of weave. Here is what our boat looks like now. There is greater transparency with the new trampolines because we picked a more porous weave. The reason being that we wanted to save on weight. The original trampoline material, being more dense, would have caused water to weigh down the front end in rough seas. For safety reasons, the trampolines had to be replaced. One side had a hole in it. That’s the side that has a kayak on it in the original photo. The hole was big enough that two people had already fallen through. For cosmetics, we chose a darker colour – Dark Blue – so as not to show the dirt. We’re told that this colour doesn’t become scorching hot. Let’s hope not. We will be making more changes shortly – cosmetic and otherwise. 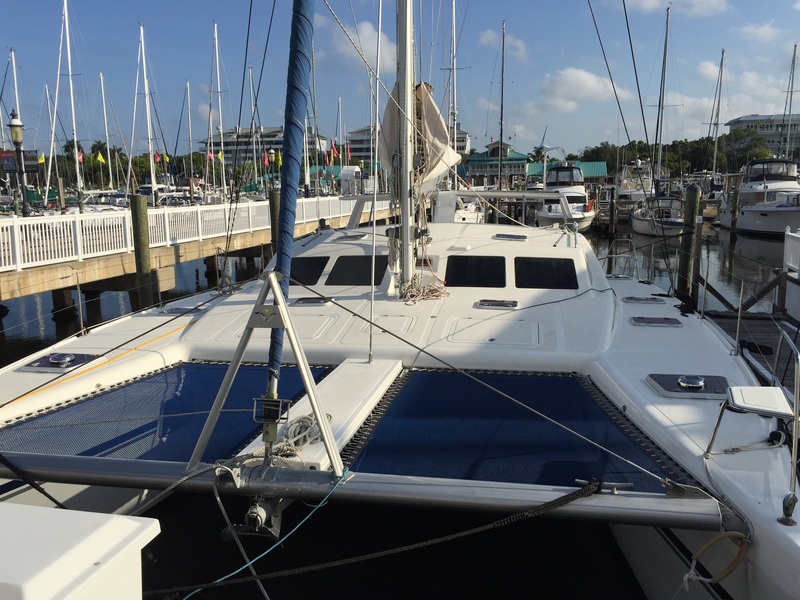 Officially, we have renamed our catamaran to its original name, SV Aphrodite. We will be updating the boat lettering and graphics soon. We haven’t had a renaming ceremony. But, we plan to once we’re all in Florida. Our boat will be ready in late June with new logo and artwork. Thanks for following me. I’m currently in Florida looking to replace the tramps on my cat. Would you mind telling me what company made your new tramps? Thanks.. I was guessing you used them, but wanted to confirm. I know they do great work, but I’m having trouble swallowing their price, especially with the Canadian dollar being where it is.